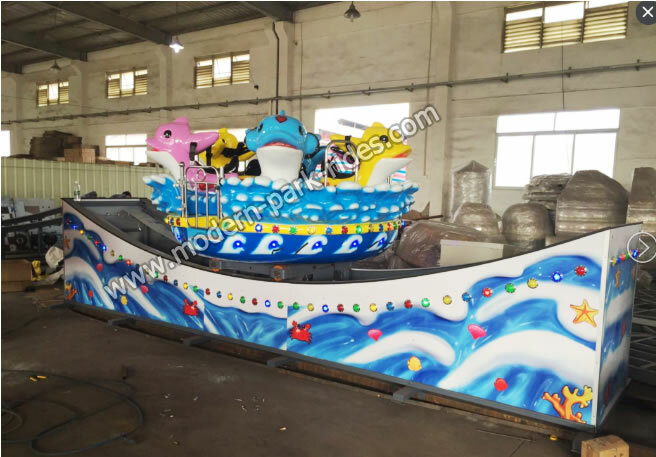 This kids amusement rides dolphin adventure is a rotary type gaming machines suitable for adults and children over 1.2M. Motion feature of the product is a set of circumferential rotation and sliding movement along the tracks; and be with beautiful shape, bright color, fiberglass model image, vivid, lifelike, bright; tourists when playing, cockpit disc smooth rotation, the body along the sliding track smoothly, and with lifelike, beautiful music and flashing lights, the passengers have the feeling of real space travel, allowing passengers to enjoy the joy of the infinite; the equipment for in amusement park, park, square, cultural centers and other places. Rotation motion of the equipment is driven by the cycloid pin wheel reducer three-phase asynchronous motor, the spur gear transmission to the slewing bearing, to make the cockpit around the slewing ring circumference rotation; sliding movement of the equipment driven by cycloid pin wheel reducer three-phase asynchronous motor, the drive pulley to the spin turn gas friction wheel, through the gas friction wheel friction drive enable the body along the track of the sliding motion.